… or, in this case, 75. The day has finally come – the day before my thesis proposal dissertation oral defense exam whatsit. I’m feeling pretty good about it, mostly because after many late nights slaving over my slides, after writing and adding and changing and tweaking language endlessly to make sure I’m saying everything I need to say but not saying too much, after spending hours running new code to produce new calculations to produce new figures only to conclude not to include them in the talk, after slashing and burning more than half of the slides multiple times, once accompanied by a despondent “arrrgghh!! He HATES it! !”… I’m feeling unreasonably ok about tomorrow because my presentation is now, well, presentable. 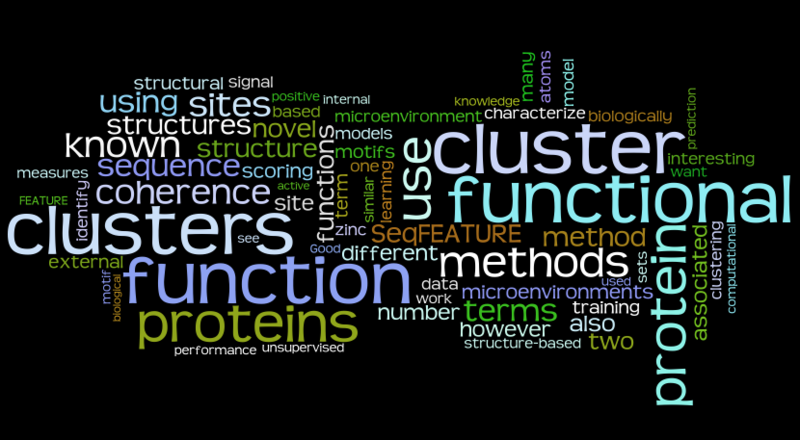 For those of you who can’t hear me extoll the virtues of machine learning methods for function recognition in protein structures, I composed a Wordle from my notes associated with each slide. I think it summarizes my thesis rather well in 75 words or less. I know, I know – I’m a little late to the party. But when I tried to use Wordle to visualize talk abstracts from ISMB more than a month ago, it took so long that I figured my browser wasn’t configured for the applet and I gave up. It appears the input might have been the problem, though, because I just tried some RSS feeds and it works beautifully. So now I’m going on a bit of a Wordle binge. Here are the 3 blogs I used to have or still contribute to: More Fist Pumping, All Exciting At First, and One Big Lab. Apparently the word frequencies aren’t weighted by the number of posts – so my recent post on 2 of the blogs asking for platelet donations for my friend’s friend Katie dominates. Aside from that, nothing too surprising. Nothing terribly informative either, but I do like the pretty colors.